. . . if you’re not telling fortunes? Often I have felt that I had been discarded here from another planet. I couldn’t seem to find common ground with others. The usual things most people valued didn’t interest me. There was always pressure to find your tribe or join a group of like minds. I couldn’t find others who shared my sideways ideology, and I didn’t fully subscribe to mainstream philosophies. I couldn’t find a passion or interest that society viewed as acceptable. Nothing satisfied me, and I felt wayward and adrift. When I started learning the tarot, I was intrigued and excited. This was a mysterious system that had the power to offer real guidance. Meanings had progressed several centuries, and on an unconscious level, laid out the present, the past that spawned it, and the likely path ahead. The tarot is not your parent or your boss, but when you have no trustworthy confidantes available, you can turn to a pack for possibilities. Even when the interpretation is unclear, it can offer so many ideas for consideration. Tarot can tell you what to do without judgment. But I prefer to view its directions as options, not predestination. 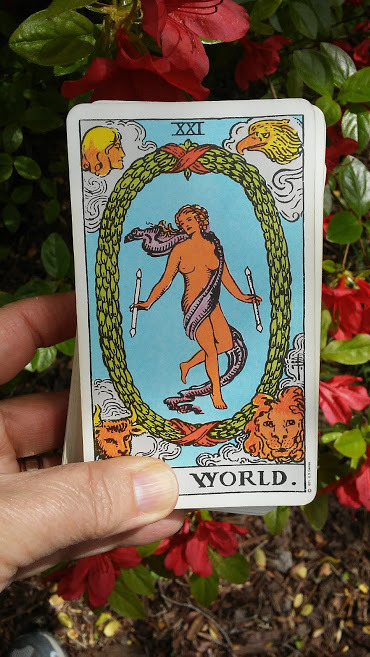 I trust a Universal Force, but still own my choices in life with the tarot offering insight. When everything else fell short of being helpful, the tarot was always available to speak the truth without fear of hurting my feelings or sugar-coating the tough love. The tarot will be completely impartial. Some people want to know when their dreams are going to come true. Because the tarot reads what is going with you, it won’t necessarily tell you where the love of your life is hiding. It might talk about your past pain from relationships, unresolved issues, or where your focus would better serve you in the meantime. So, you might not always get the answers you want, but you’ll most likely get the ones you need. Many people consider tarot to be frightening or negative. In my experience, it all depends on who is doing the reading. There are diplomatic ways to deliver news that is not so positive. I’ve had people say, “I don’t want to know anything bad.” Okay. I don’t focus on doom or gloom. Even if I see the darkness, I do my best to shine some light there. But we live in a world of duality. Life can’t be all rainbows and fairy dust. I appreciate a heads-up so I can shift or adjust. The tarot can give you that if you’re open to receiving.